PATRICK ASSARAF has selected Toronto and New York-based agency NKPR as its public relations agency of record (AOR) to establish the line as the premiere men’s label driving demand for must-have luxury essentials throughout the North American market. NKPR will work with PATRICK ASSARAF to provide strategic counsel, media relations, influencer outreach and event management support. 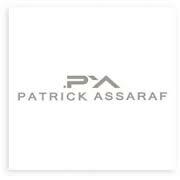 NKPR will focus on creating new strategic brand partnerships and retail relationships to engage customers while elevating the PATRICK ASSARAF profile with fashionable clientele worldwide.